In October, 2011, I attended a live screening of the 25th anniversary performance of Andrew Lloyd Webber’s The Phantom of the Opera. It was phenomenal. There were extreme closeups of every actor—and their costumes. I immediately decided to recreate every costume from the show. Unfortunately, I simply don’t have the storage room in my house for such an endeavor, so I scaled back my plans. I’ll be making each of Christine’s main costumes in miniature—for the Gene doll. 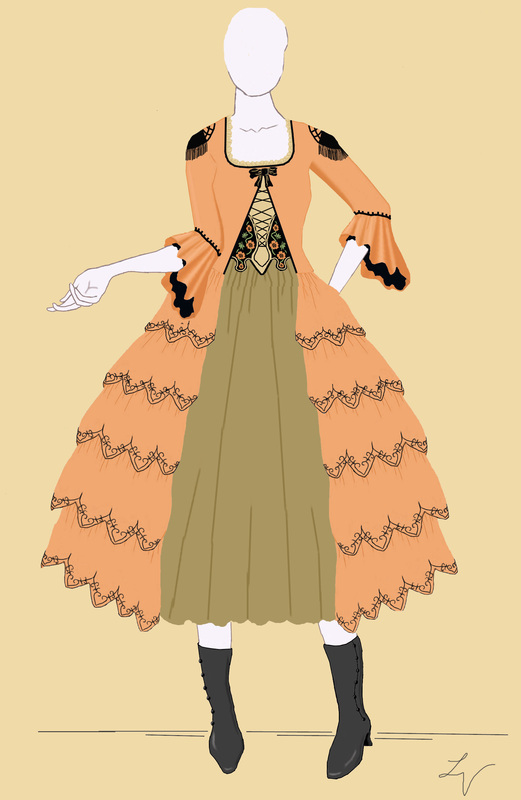 During the song “Point of No Return” Christine wears a ruffled peach and black dress that’s sometimes known as Aminta’s dress. This is the first costume I’ll be recreating. This Victorian interpretation of an 18th century costume is made of a dark peach silk and accented with black embroidery and lace. The bodice has a zone-front that cuts away to reveal a heavily embroidered stomacher. Its elbow-length sleeves have full cuffs lace ruffles. The skirt splits at the front, showing an inset of gold and black. The rest of the skirt is tiered, with scalloped ruffles that are edged with black embroidery. I found the perfect fabric in my stash—a copper-gold shot taffeta that’s very lightweight. 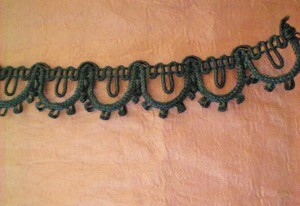 Instead of embroidering all the ruffles, I found a black Venetian lace that would give a similar effect. For the shoes, I found a dainty pair of black Victorian boots that work perfectly. For some reason, this was the costume that most excited me, so I’m pleased to report that it’s already been started. Have you ever made anything similar to this? What tips do you have for working in doll-scale? This entry was posted in Sunday's Someday Projects and tagged 18th Century, Dolls, Replica, Sunday, Victorian. Bookmark the permalink.